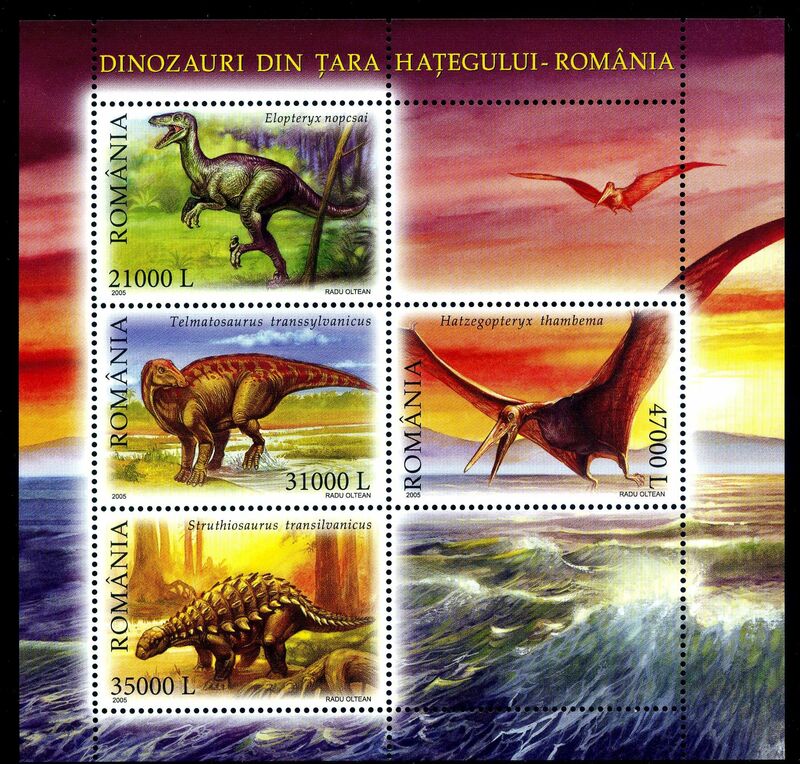 Romania 2005 "Dinosaurs from Tara Hategului - Romania"
Romfilatelia, the specialized company in issuing and trading Romanian postage stamps, releases an issue dedicated to the natural patrimony of Romania, called "Dinosaurs from Tara Hategului"
Tara Hategului lies between the Retezat Mountains and the Sureanu Mountains and it is well renowned for the beauty of its landscapes, but also for its archaeological and hystorical vestiges, its old churches and its folk traditions. 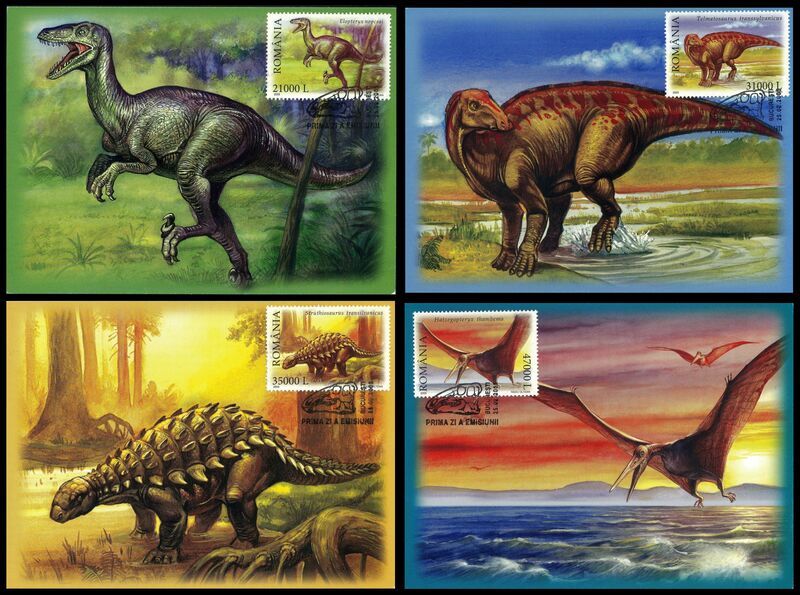 The traces of several dinosaurs species discovered here add a certain special interest to this land. 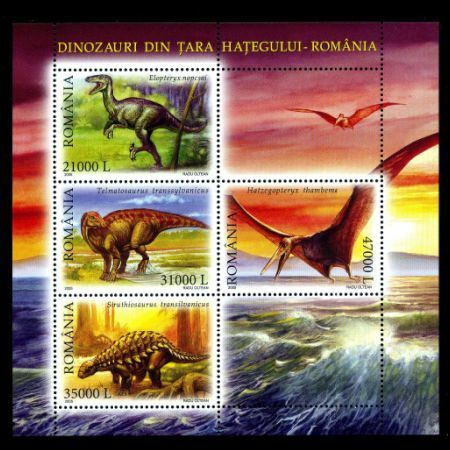 The dinosaurs from Tara Hategului are famous all around the world and they also appear in the documentaries of the Discovery TV channel due to some peculiar aspects: they made up a last community of herbivorous and carnivorous dinosaurs, just before the final disappearance of those animals, 65 million years ago. 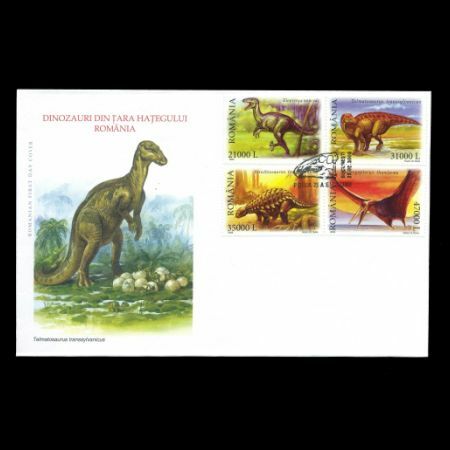 Further more, all the species of this fauna were smaller in size compared to their relatives from other European regions. 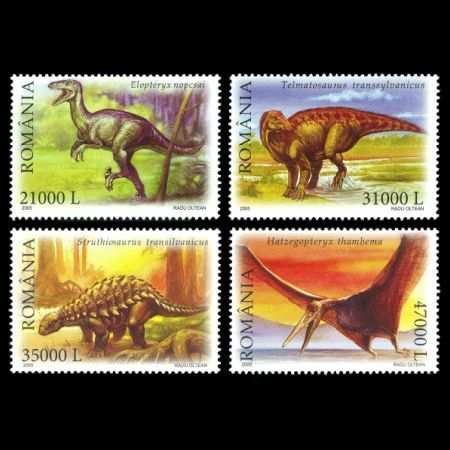 It was this specific feature, unique throughout the world, that drew them the name of "the Liliputian dinosaurs of Transylvania". Their small dimension can be explained by the environment they lived in - an island about the size of Corsica, surrounded by ocean. 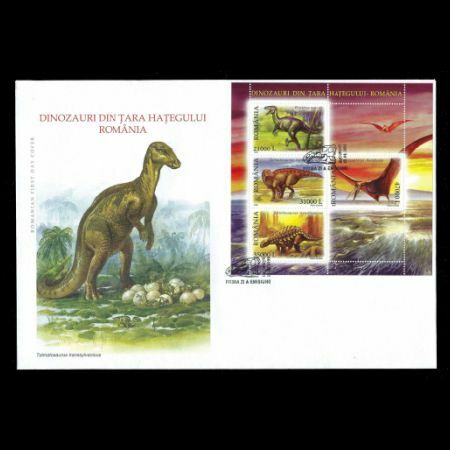 Giant reptiles flew above the Liliputian dinosaurs, as a biological paradox which increases the scientific interest raised by this fossil fauna from Tara Hategului. The places were the bones and the nests with eggs were discovered lie near Sarmizegetusa Ulpia Traiana, in the neighborhood of the Densus and Ru de Mori churches, of the Colt Castle and of the Retezat National Parc, this entire mirific region of the country being at present part of a special protected area: The Geoparc of the Tara Hategului Dinosaurs. 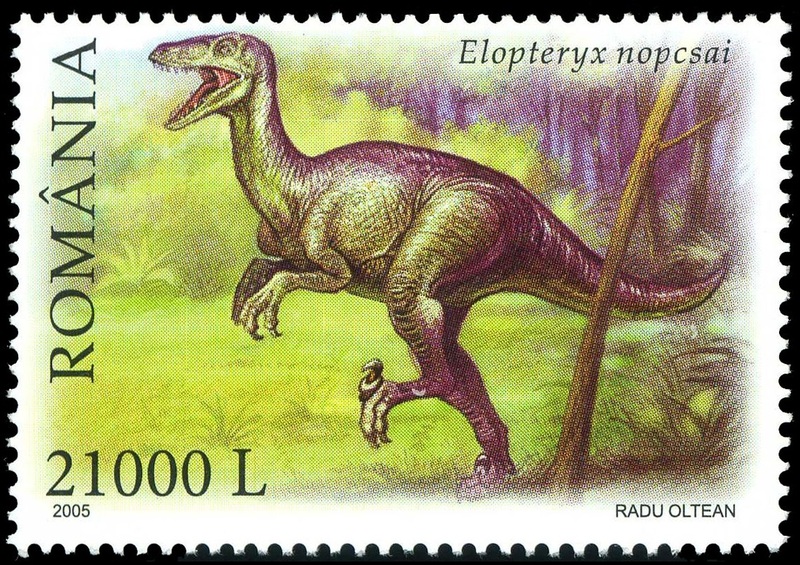 Elopteryx nopcsai is one of the carnivorous Liliputian dinosaurs, skilled runners which used to hunt in herd. 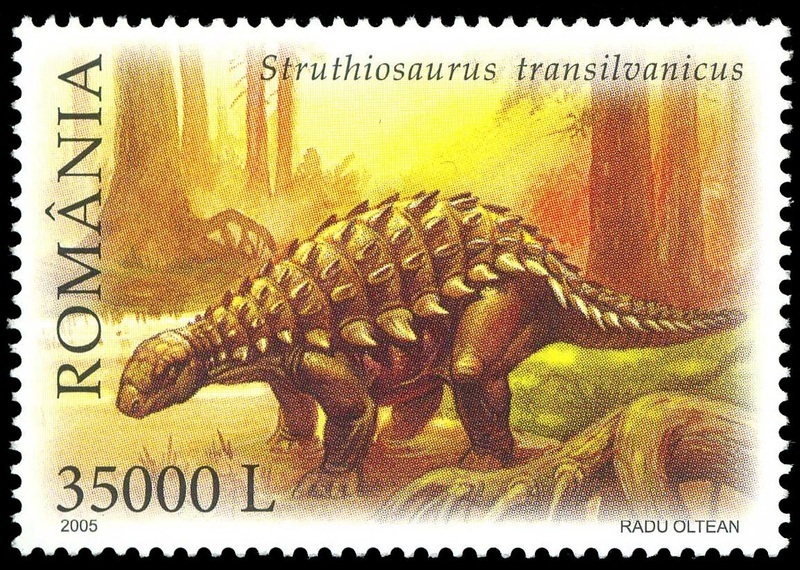 It measured less than one meter in height and weighted around 5 kilos. It may have had feathers on its body because the group it belongs to is at the origin of birds. 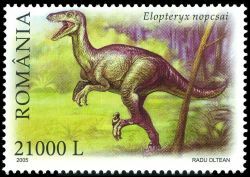 Its image is illustrated on the postage stamp with a face value of 21,000 lei. 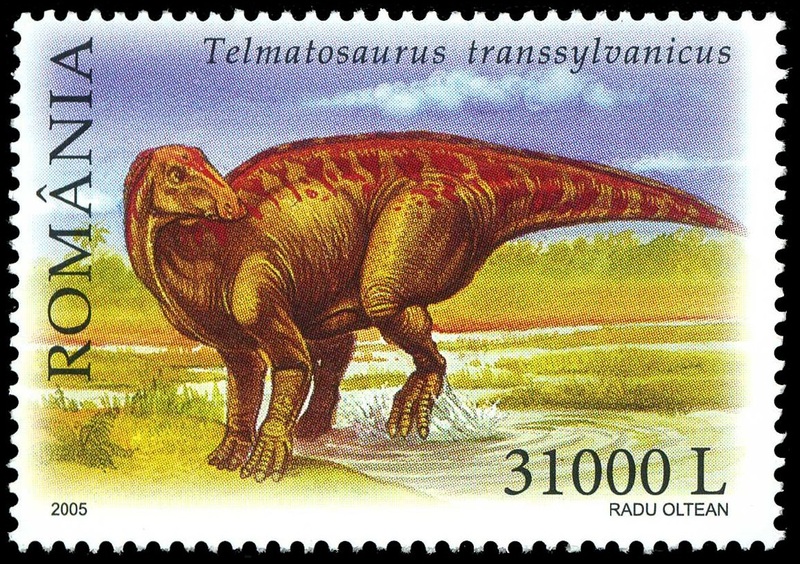 Telmatosaurus transsylvanicus, reproduced on the postage stamp with a face value of 31,000 lei, was an herbivorous dinosaur from the "duck-beaked dinosaurs" family, which inhabited the river-sided areas. 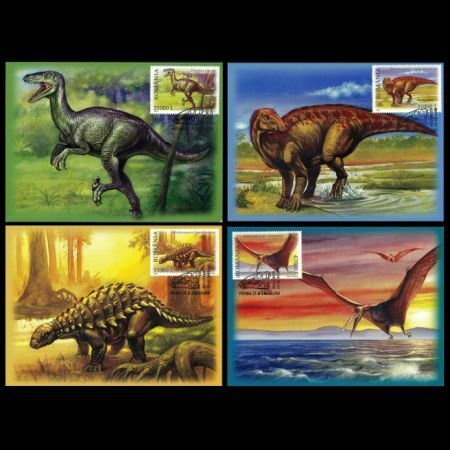 Besides the remainders of the skeleton, from this dinosaur are also known eggs placed in the nest and bones of the cubs that failed to survive. 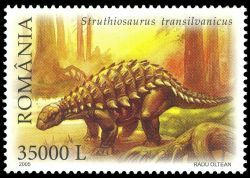 The postage stamp with a face value of 35,000 lei illustrates Struthiosaurus transilvanicus , an herbivorous dinosaur, with plates disposed on the surface of the skin as a means of defence against the predatories attacks. 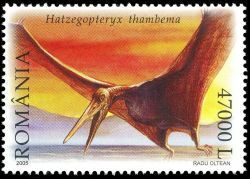 Its size did not outrun 3,5 m. Hatzegopteryx thambema, name which translates by "the winged monster of Hateg", belongs to the "Pterosaurus" group, made up of the flying reptiles contemporary with the dinosaurs during the Mezozoical Era. 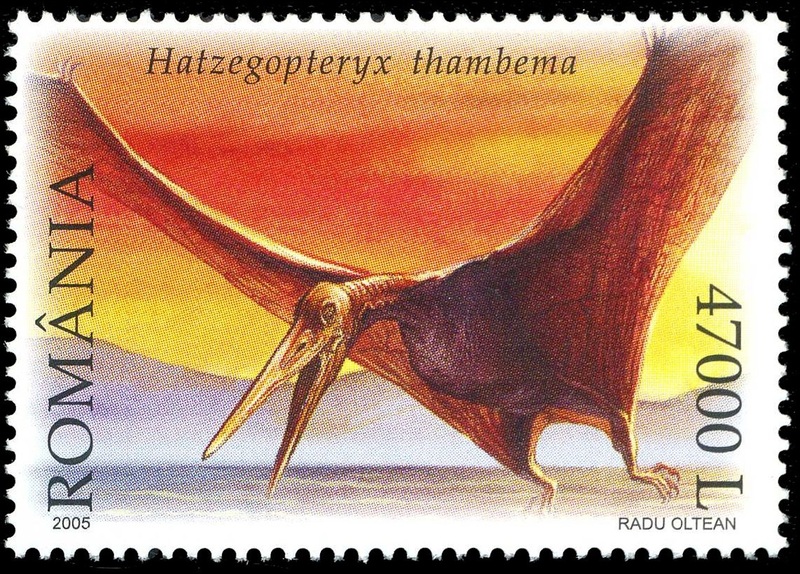 It was probably the biggest flying animal of all times, with a 3 meters skull length and about 12 meters distance between its ajar membraneous wings. 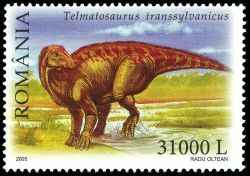 This Gulliver of the "Liliputian dinosaurs" world is being represented on the postage stamp with the face value of 47.000 lei.